Lina gave me the plan and dimensions of her terrace and I upholstered it according to my own taste. 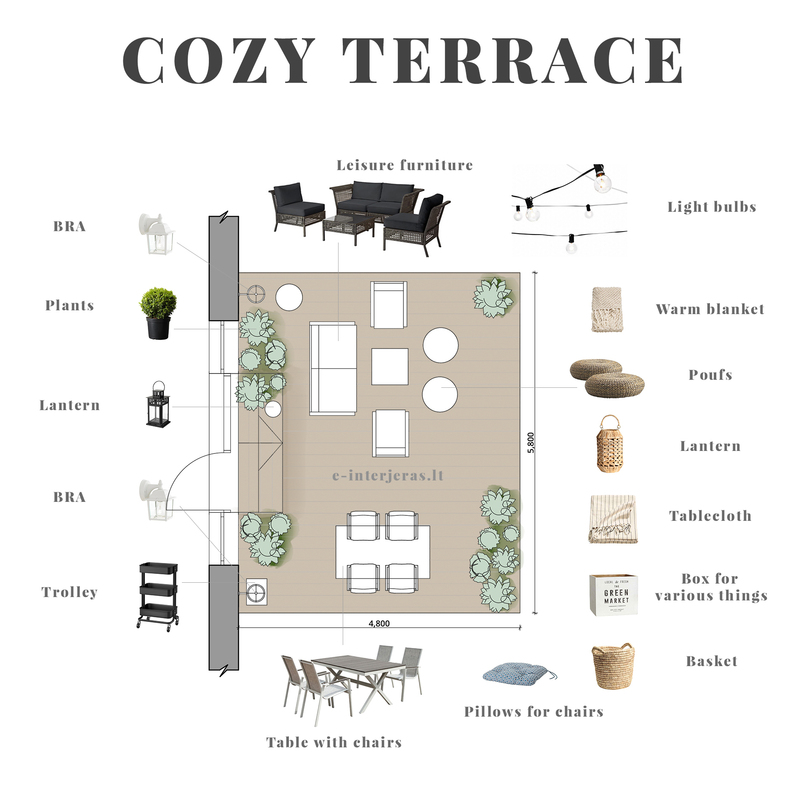 Probably the majority of people who have their own house or a cottage are dreaming about a cozy terrace. If you only put several pieces of furniture, there‘s still a lack of coziness – some more elements are necessary. 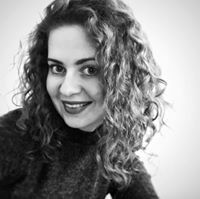 Lina from geltonaskarutis.lt gave me the plan and dimensions of her terrace and I upholstered it according to my own taste. Please look at the end of the article how it looks like! That‘s one of the most important elements in the evening. 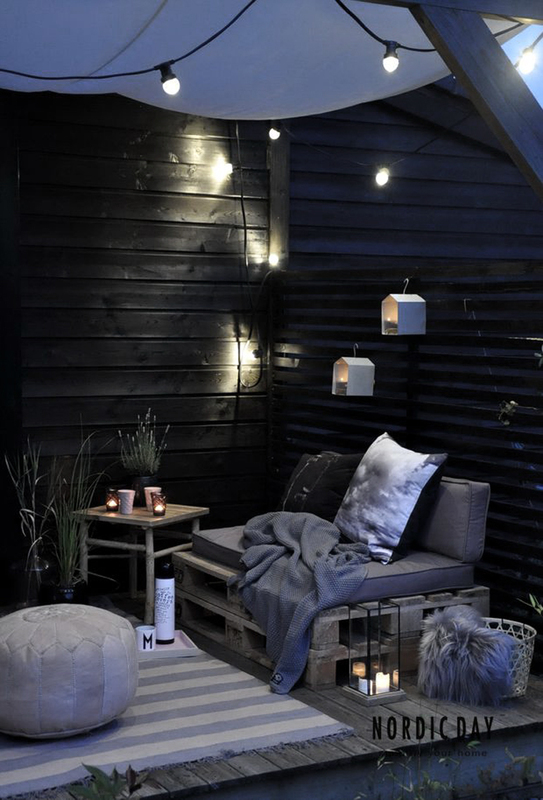 There‘s nothing cozier than a mild and unobtrusive light which‘s created by the BRA lamps or string lights. Don‘t forget that illuminators must be resistant to moisture, therefore, we would advise to choose the ones whose class of resistance to moisture is at least IP60 (if a terrace is open). 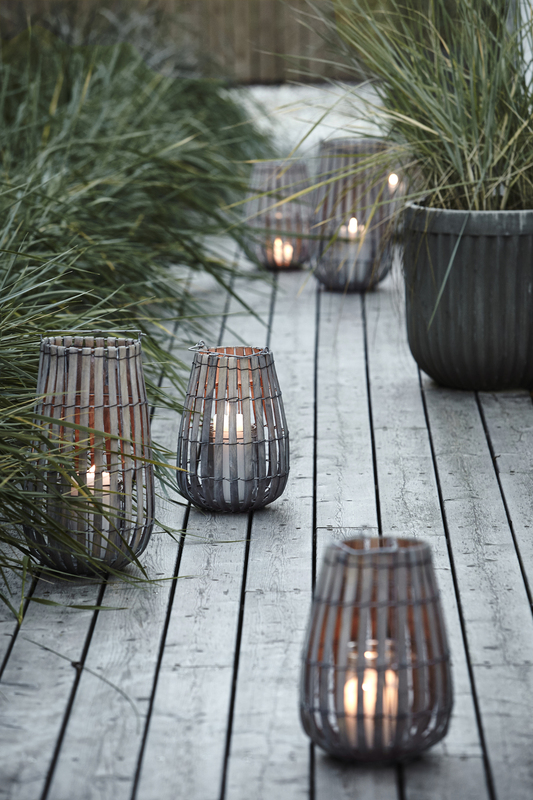 Candles in lanterns or candleholders will create an especially romantic mood when the weather doesn‘t harm one with the rain or a strong wind. I think it‘s not even worth convincing – the plants create coziness in any environment. I‘m not the expert of plants, therefore, it‘s better to discuss with specialists and to choose such plants which aren‘t afraid of wind and other outdoor conditions that aren‘t so favourable. 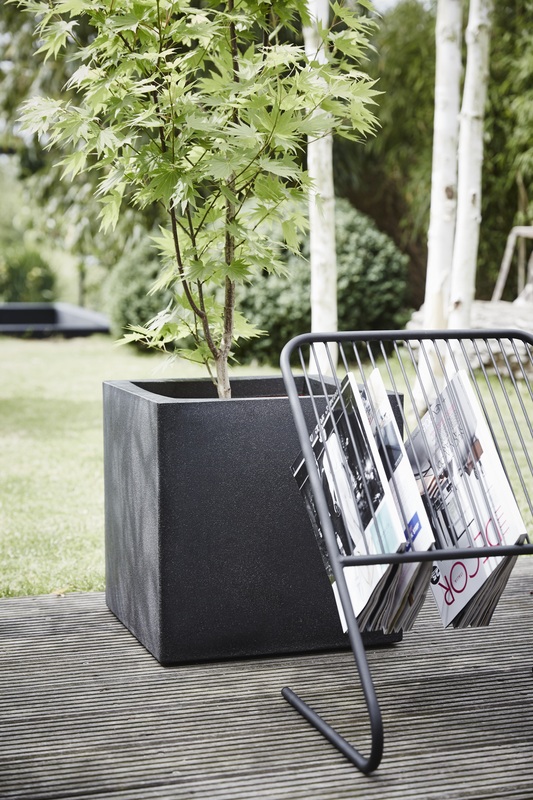 If you need you can temporarily bring the plants from indoor to a terrace. In this case the family lunch, gathering of relatives or a friend party will gain a cozier atmosphere and when everything ends you can bring everything back indoor. Artificial plants is a good way not to ransack one‘s brain about a plant care and always see greenery. It‘s acceptable not to all and for the part of people it causes contradictory feelings than coziness. Choose in accordance to your sensations. Pillows, tablecloths, blankets and even light curtains are the items which will undoubtedly help to create coziness. 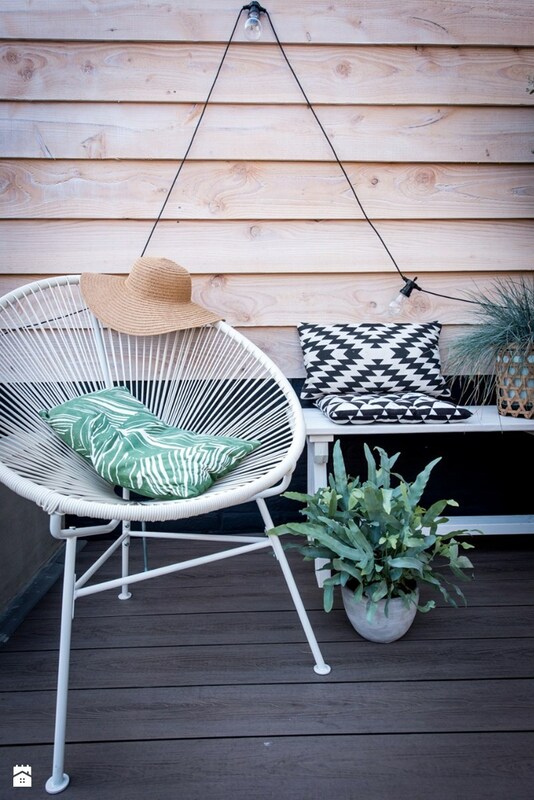 It‘s not necessary to always keep everything in a terrace – please have the place dedicated to it at home and when you need, bring those items outdoor. Sometimes it‘s worth placing them only because of their beauty. Though you can always use boxes and bags on purpose – put blankets, magazines or other items there that will be necessary in a terrace. The situation with furniture is complicated. 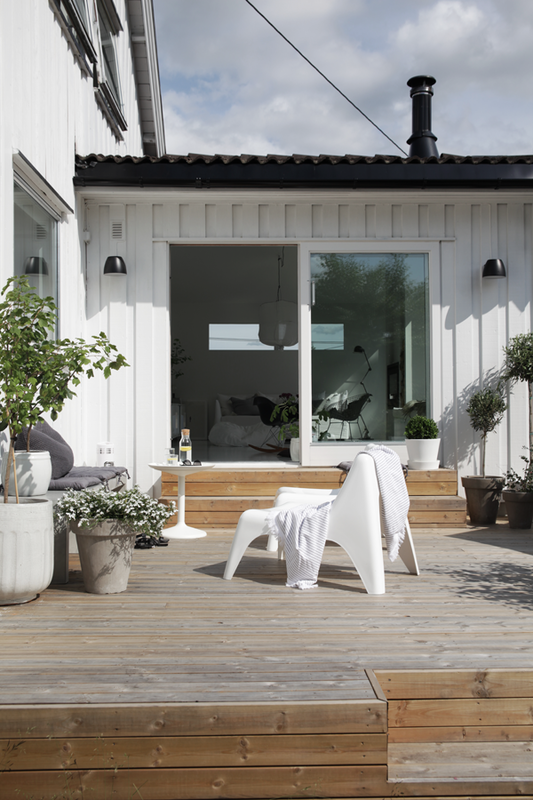 If outdoor furniture is nice, most probably they‘ll be wooden and will worn out in a shorter period of time. If you want rather lasting furniture please buy metal, plastic or other furniture that‘s resistant to the impact of environment. Unfortunately, they don‘t look so cozy as wooden but if you take textile into help you can completely correct the view. You shouldn‘t forget poufs, either. When the guests gather, it‘s possible to seat them in an easier way. 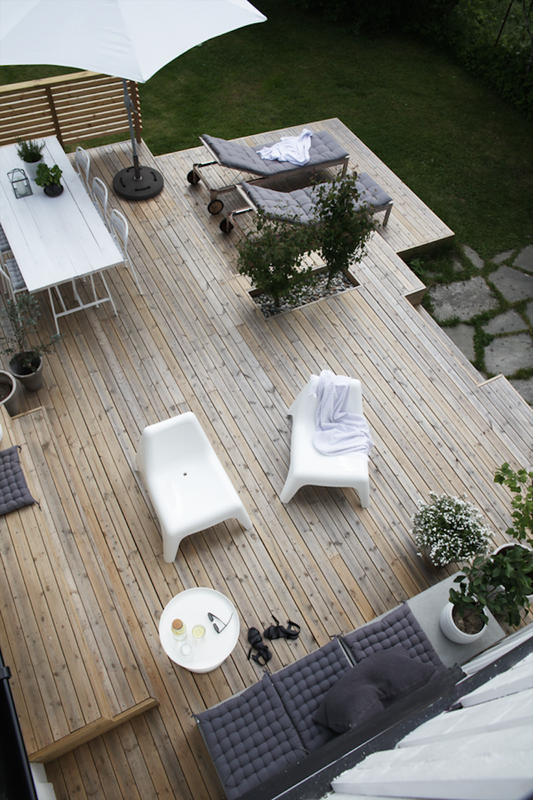 If your terrace isn‘t so big, that would be a mistake to choose massive outdoor furniture. They‘ll look non-proportional with the whole house and there‘s no space left for anything else. Massive furniture is rather applicable to spacy terraces. You can always partly cover a terrace from the rain, wind and the stares of neighbours. 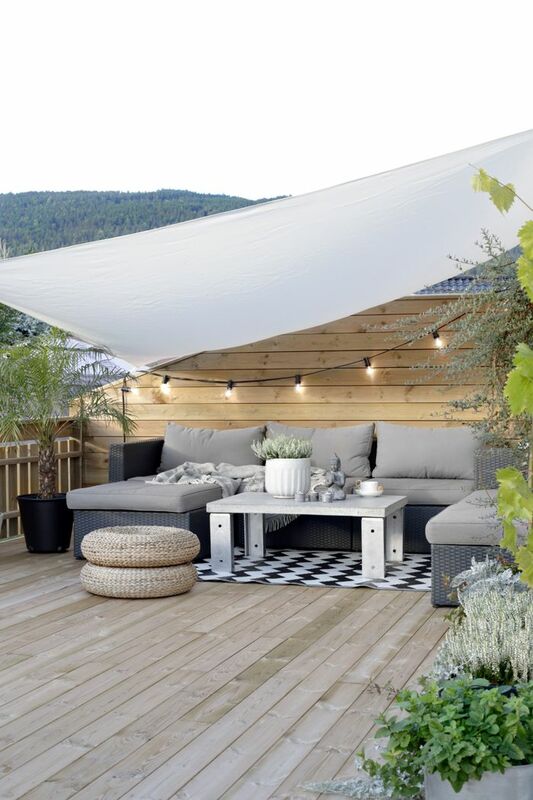 If you have a covered roof you can hang swings, hammocks, a rocking chair, plants and the garland of illuminators or lights. Does that sound cozy? It‘s so! It also lets one use the furniture resistant to moisture. 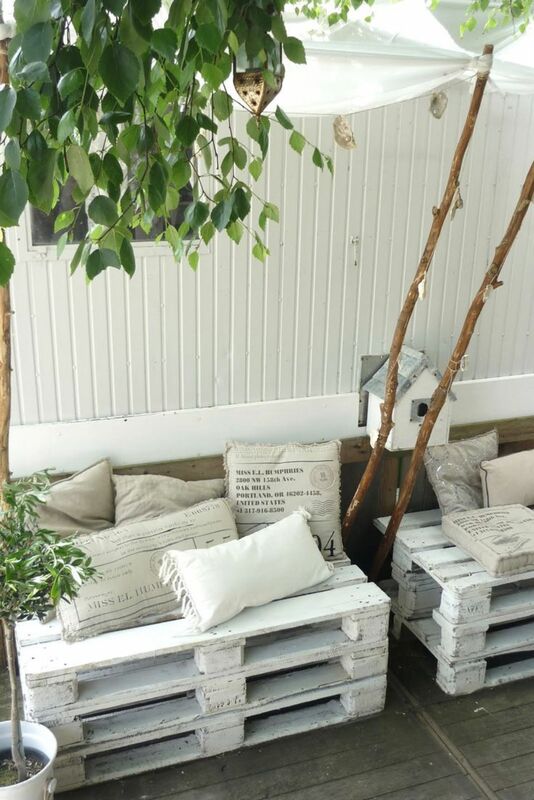 A rather popular solution of furniture is to make them by your own out of euro palettes, therefore, when you cover them a bit and impregnate for a while you‘ll enjoy nice wood for a longer time. 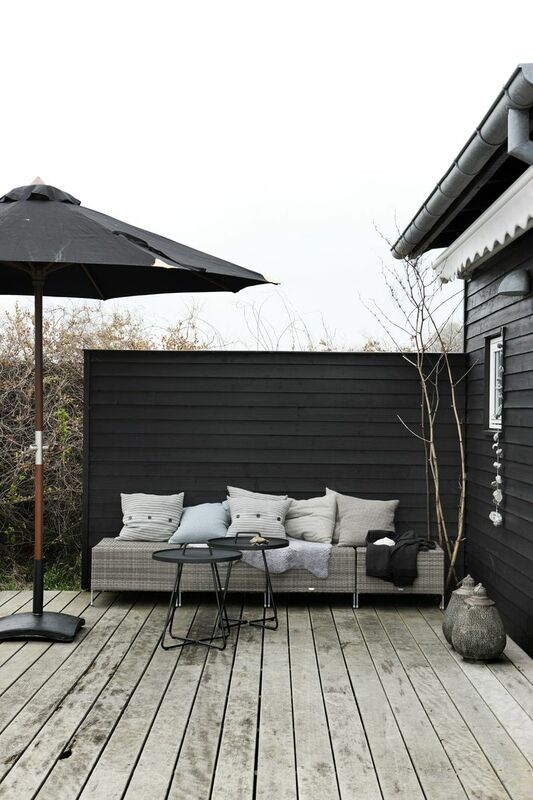 If you cover at least one side of a terrace with wooden wall (or in another way), you can plant it with plants, hitch plants, nesting boxes and bulbs and to create a cozy rest zone over there. Don‘t overload a terrace. Group items in severals and leave some space for passages. 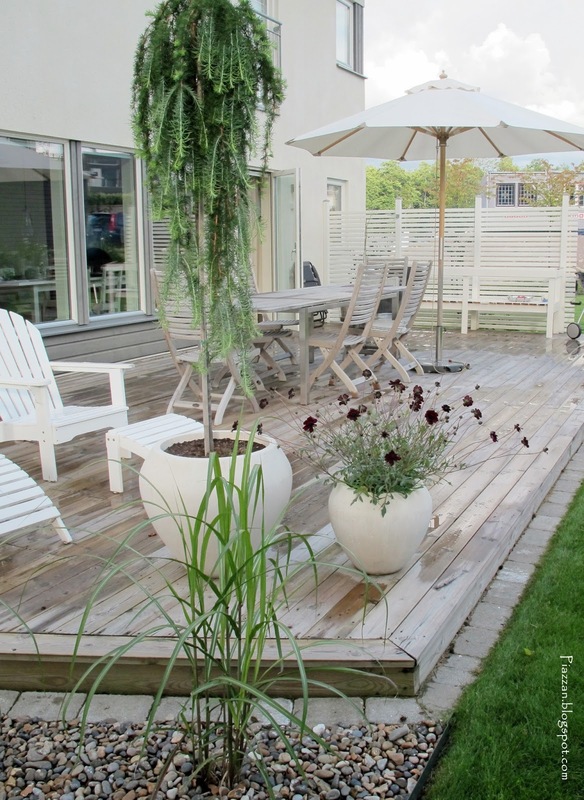 For example, I grouped this terrace into two larger parts: a dining zone and a resting zone. I‘ve also grouped plants – the group on the stairs and close to them, the other group partly covers a dining zone and due to the common perfection – the larger plant is placed in the edge of a rest zone. Newer post Interior color palette. Inspiration from nature. Thank you! I'm glad it was useful.